Phyllis started her literary career on the other side of the transaction as a bookstore owner. This was a practical way to share her love of books – her college major was business, not English or creative writing. She hosted a wide range of authors, such as Connie Briscoe, Charles Evers, Walter Mosley, Evelyn Palfrey, Francis Ray, Kimberla Lawson Roby, Ntozake Shange, and Tavis Smiley to name a few. All were gracious and tolerated her questions about their writing careers. Walter Mosley in particular, encouraged her to write. Twenty years later, and Phyllis is author of the novels Down Home Blues and Forty Acres. She co-wrote Let the Brother Go If… with Ms. Dupree, formerly of the Tom Joyner Morning Show and is a contributing writer to Chicken Soup for the African American Woman’s Soul. A writer of diverse interests, she has written articles on black history subjects for American Legacy Magazine and theMemphis Commercial Appeal. She is a former National Bank Examiner, who now writes full time, but feels an obligation to pass on the knowledge she gained from her years in the banking industry. She is a presenter on financial literacy, community development and entrepreneurship (after all – folks can’t buy books if they don’t have any money). She is a graduate of the University of Wisconsin–Milwaukee and resides in Memphis, Tennessee. 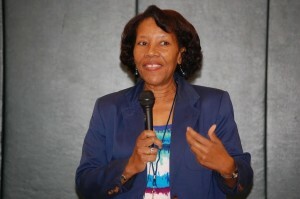 She has three adult children and is a proud member of Delta Sigma Theta Sorority, Inc.